•	Joe Fresh customers can purchase gift cards at a discounted value. Gift cards with a face value of $25 and be bought for $20. These kinds of deals are available all year round. 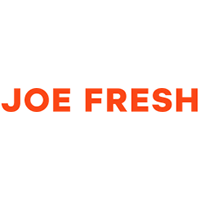 •	Customers visiting the website for the first time can sign up for the free Joe Fresh email newsletter and get an instant discount of 20% off of their first order. Customers will also get other deals and discounts sent to them on a regular basis. •	The SALE section of the Joe Fresh website is home to deeply discounted merchandise. Customers can find products marked down by between 20% and 40% here regularly. Joe Fresh is an apparel site that offers a 20% discount on your next order for signing up with your email address on the landing page via the pop up. This North American company is headquartered in Canada with brick and mortar stores in the North Eastern US, the Middle East, Mexico and other countries. Joe Fresh offers apparel for the entire family. Visitors can shop via the category they are interested in like women, men, boys, girls or they can click on the sale tab to view the most recent discounted items. International shipping is available at special shipping rates. For most up to date offers check out Joe Fresh on Facebook and Twitter or contact Joe Fresh Support for any questions.